Today we decided to check out the 72nd Annual Oregon Logging Convention at the Lane County Fairgrounds. While my tendency is to favor strict environmental regulations I also acknowledge that logging plays a large role in the Pacific Northwest and when managed responsibly is a sustainable resource that provides us with a wide range of products from lumber to paper. 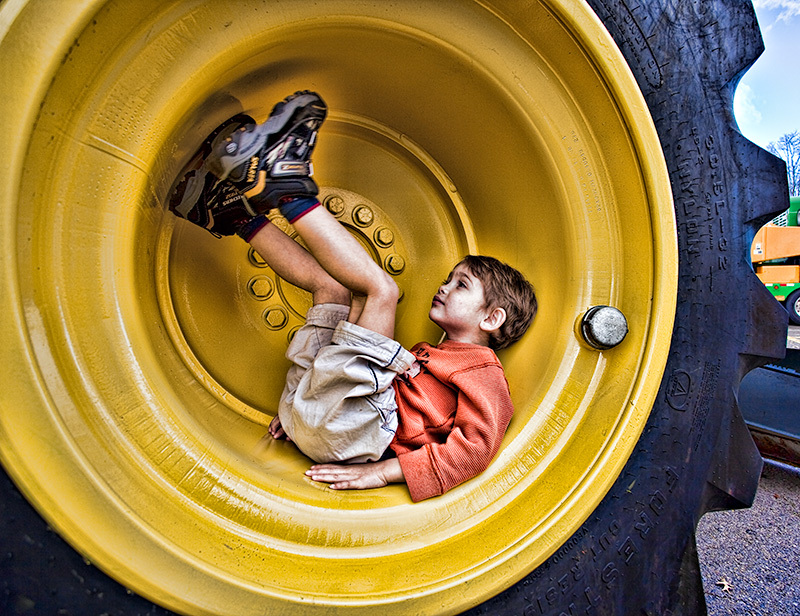 With that said we really wanted to check out the heavy machinery (at least the boys and I did) as they let you climb up inside many of them. 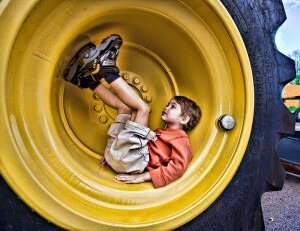 This photo is of my son taking a break inside a giant wheel on some logging equipment. There were all kinds of heavy machinery there. After seeing a few episodes of “Extreme Loggers” on TV it was interesting to see some of the equipment and realize how large these things really are. There were quite a few interesting exhibits. In one area they had some hand saw competitions with teams of two trying to saw through a log as quickly as possible. There were some kids activities too with a lady making balloon creatures, some arts and crafts and a face painting booth. One of the more interesting booths there was one by Wildlife Images which is an animal rehabilitation and education center down in Grants Pass. They provide care and treatment for sick, injured, and orphaned wildlife indigenous to the Pacific Northwest. They had a few birds with them, a spotted owl, a rare white colored Harlans Red-tailed hawk and a Harris hawk. The lady was telling me that the Harlans Red-tailed hawk had flown into a building and that he was completely blind on his right side. Since hawks require perfect depth of vision this hawk is no longer able to hunt on his own. These birds are really magnificent. Regarding Pacific northwest logging, your key phrase is “when managed responsibly”. I could count on the fingers of one hand the number of logging comapnies where that mantra is one of their guiding principals of operation. Most go for maximum cut with as little cost as possible….which translates to massive clearcuts (check out private timber land in the coast range along 126 to Florence) and easy access thru construction of a maze of logging roads which are very damaging to the health of streams and fisheries (siltation, high water temperature, high water flow, stream bed scouring, loss of aquatic insects, etc.). And why do they need those roads….well, of course, to move all that heavy logging equipment you were gawking at to where the trees need to be cut! Many of these sites would be better served through judicious use of helicopter logging.. Finally, although the logging industry is loathe to give up the cutting of old growth timber, all of our wood products needs can be satisfied by second growth timber. Again, its a matter of economics. They need to retool their mills for smaller second growth logs and away from the large diameter ancient forest timber. Our few remaining old growth stands are of much greater value to society left standing for future posterity, for water storage and purification, for carbon sequestration, for wildlife habitat and for recreation. As for our Oregon state forests, managed by the state forestry board, these are being cut at an unsustainable rate even today. The reason….the State Forestry Board, charged with wise management of the state forests is top heavy with timber industry shills, whose emphasis is always on “get the cut out”…not conservation or non-timber values. Finally, the Harris’s Hawk you mention in the bit about Wildlife Images of Grant’s Pass is a hawk not found in Oregon and is certainly not indigenous to the Pacific Northwest. It’s range is primarily norhern Mexico with a few incursions into southern Arizona, California, New Mexico and Texas. They didn’t find this hawk in Oregon unless it was some rare “accidental”. The Harlan’s red tail is a very interesting find and is uncommon in Oregon. There are light, intermediate and dark morphs of the Harlan’s and they are beautiful so you were fortunate to see one but sad that it was under the circumstances you described. Good article Matt. I just had to stick my two cents in on this, a subject dear to my heart. I’m sure the boy’s had a blast with all that heavy equipment. I used to love seeing those machines too, when I was growing up ! Not so much now however! @Tracker – Thanks for the comment. The Harris hawk was one raised by a falconer and is too imprinted on humans to make it in the wild. It doesn’t know the difference between a human and another hawk. It is therefore not able to survive on its own. The Harlans red-tail was definitely a light morph as it was mostly white and speckled with brown.